Great photo Holly. I have made it one of our featured photos. It will appear on our front page every now and then. Aliums are one of my favourites so what a joy to see such a photo. It's in my favourites! 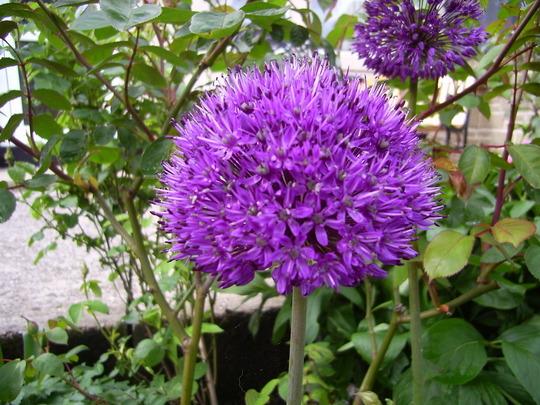 Lovely photo Holly, are alliums easy to grow? Are they sluglicious? HI Tussiemussie, pleased you like my photo of the allium. They are so easy to grow and flower for such a long time. This one is purple sensation planted last autumn, only cheap bulbs bought from Wilkinson's, I know they will come again in future years because I have allium christophii which has flowered for a few years and I was told by a grower at one of the shows I visited that if left alone will self seed. I will see if I have a decent photo of christophii the flower head is amazing like an exploding firework. Wow! While I was browsing, I came across this picture. It is awesome. Great picture. Recently planted some of these hope they turn out as good as that, splendid picture. This is a testimony that it takes years to really see all there is to see on Goy. Here it is 2010 and I'm just checking this gorgeous picture out. very beautiful ,im hoping mine too would look like this.